Have you tried out Brad Feld’s version of Hacker News? Most everyone in the startup community is familiar with Y-Combinator’s Hacker News. If you’re not, it’s pretty simple, it’s like Reddit but rather than all news it’s just hacker news. Most of the community contributed stories involve hacking, coding, design, development and startups. One of the problems with Hacker News, for me at least, is that I am only looking for startup news. Hacker News gets a tremendous amount of contributions every day, so it gets to be cumbersome weeding through the stories to find the startup news relevant to me. After I track down the startup news on Hacker News I just want to get to the story and barely have time to comment, even if I want to. 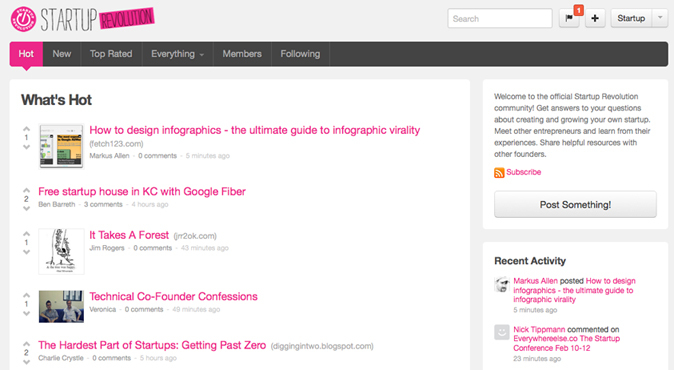 Brad Feld has introduced a new site similar to Hacker News but all about startups. The site is called The Startup Revolution Hub, actually has a nicer looking UI and is easier to navigate. Best of all I don’t have to weed out general coding and dev posts to get to the startup posts. The Startup Revolution Hub was launched earlier this month and has already amassed 250 users. It functions like Hacker News and Reddit. A user can post a story, comment a story and move a story up or down by hitting one of the arrow buttons. Community members are also sharing their thoughts, best practices and advice in posts like “Technical Co-Founder Confessions” and “The Hardest Part of Startups: Getting Past Zero”. If you haven’t signed up for Startup Revolution yet, you may want to. Joining a community early has it’s advantages and I’m sure it’s going to get quite popular, quickly. Waterloo Canada: What Do You Do When Your Tech Giant Fails? stopped reading there. you obviously don’t know what you’re talking about.